Product was amazing, well worth the money. It is like the Rollys Royce of strollers. This stroller is next level amazing! 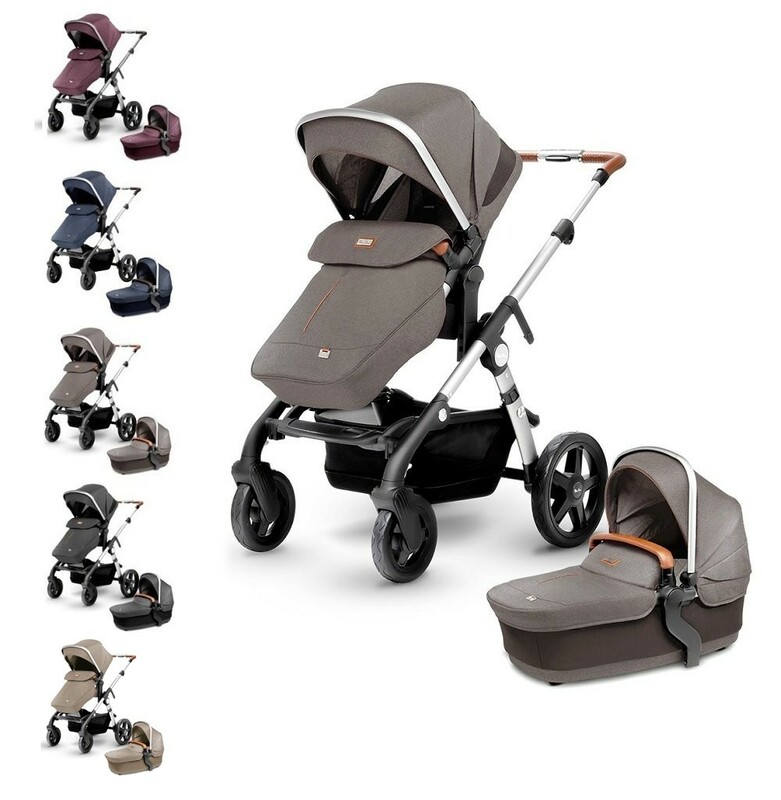 The Silver Cross Wave stroller takes your day out with your baby to the NEXT LEVEL. It is the Rolls Royce of carriages. If your going for a posh look that is durable this is it! Not only is this stroller functional and durable, the fabrics are amazing and the basket holds a ton of weight! Cool perk, when you wanna put two kids in it they stack so it stays slim. Switched from my Uppababy Vista - and couldn't be happier! So just a little about me. I am a mother of three kids, that just had my fourth child on March 16. I've had my Uppababy Vista from last year for my 14 month old. It did the job for me but I was never really happy with the stroller. It was big and bulky and frankly I hated how it looked. When I saw the Silver Cross Wave at the ABC Expo show recap I was ecstatic. It looked like everything I was looking for in a single and double stroller and on top of that it was GORGEOUS! I went into Babys Den in early March to see the stroller in person. It was even more beautiful in person. Admittedly, the stroller was a big heavier that I had wished but they told me that was because of the magnesium alloy built frame to make sure it is super sturdy and smooth in any push. I decided to bit the bullet and purchased the Wave. It was great that everything I needed was already included in the stroller. It came with a cupholder, seat liner, aprons for both the stroller and the bassinet and car seat adapters that worked perfectly with my Nuna Pipa. I purchased the additional diaper bag because it was quite beautiful too and completed the look (the diaper bag I am writing a different review for but 5 stars for that as well!) I also purchased the tandem seat since I will be using the stroller as a single and a double stroller. I walked out with the Claret color and used it for my 14 month old. Right away I noticed Wave stroller pushes way better than my Uppababy Vista. It has a much cleaner push and moves up curbs a lot easier as well. The fabrics are MUCH MUCH higher quality than any other stroller I have seen. The basket is waterproof and holds 33 pounds which is about 20 pounds more weight than the Vista. The Wave also allows you to keep the stroller seat or bassinet in the higher position which gives more access to the bassinet, but also allows you to be closer to the baby. I love this position and keep my bassinet and seat in this position even when I am using it as a single. My baby was born mid march and I had to switch the stroller into a double stroller. Switching the Wave from single to double mode is really so easy. It just takes a couple of steps and wallah I had my double stroller. The lower seat is almost the same size and the main seat but holds 45 pounds instead of 55 pounds for the main seat. By comparison, the Vista only holds 35 pounds which is why everyone complains that it is very hard to push as a double. As a double stroller I use the bassinet on top and the tandem seat on the bottom facing out. My newborn is in the bassinet on the top position and my 14 month old is out facing the world. I know my Uppababy stroller does not allow you to use this position in double mode and I believe there is no other stroller in the market that allows you to do this - this is exclusive to the Silver Cross Wave. A bit heavier than other strollers but definitely worth it! This stroller is something special! The Silver Cross Wave is something special.. The stroller is very well made and includes everything we can think of. I especially love the extra large, sturdy shopping bag where I can store all bags while on a long shopping trip. Another thing I like is that the carriage is pretty high, so no need to bend down when putting in or taking out baby. The handle bar is leather, so it's comfortable and doesn't sweat. The attached sunshade is great and looks neat too. It is kind of heavy, but oh so worth it! Every day walking, strolling, bassinet used for overnight sleeping. Works well on all terrains. This stroller is AMAZING in every aspect! When I first ordered the stroller, I was a tad hesitant given I ordered the stroller and never even pushed or saw it. The moment I pulled it out of the box, I knew this was the stroller of all strollers (It even smelled like a brand new BMW). The quality of the stroller doesn't compare to any other stroller. I have two kids under two and a half and it is SO practical to use and meets all of our needs. Putting it together, taking it apart and converting it from a single to a double is easier than any other double stroller you'll find. The fabric on it looks as if it is Hugo Boss suit. The bassinet and seat are comfortable and a great size (my two and a half year old is very tall for his age and fits in it well). The basket is HUGE and fits everything we need to perfectly. Maneuvers so easily and pushes like a dream, you can definitely feel the quality the instant you push it. I have multiple strollers and this doesn't compare to any other stroller. its your single, double, all terrain, fancy and practical stroller all in one! I couldn't say enough about it!